While watching the newest release of The Beauty and the Beast, I found myself admiring all of the crystal chandeliers throughout the Beast’s castle (especially those during the famed dance). That got me to thinking… how could one realistically clean all that crystal? I know that it is a movie, but how could anyone expect to clean all of the individual crystals in any reasonable amount of time? The drip-dry chandelier cleaner from Extend-a-Finish is the answer to keeping 1 or many crystal chandeliers sparkling clean! How does this cleaner work? Simply spray this product over the chandelier and allow it to drip off the product. You will have to spray on a generous amount of the product, so that you can encourage the liquid to drip. Underneath the fixture, be sure to place a drop cloth or an old towel to soak up the drips that fall. After the fixture has had a chance to dry, you are left with a beautifully clean crystal chandelier. No wiping, no disassembly. 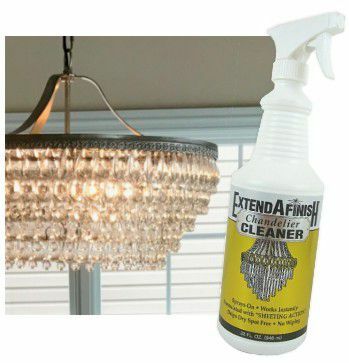 If you have crystal chandeliers, save lots of time and clean all of those nooks-and-crannies in a cinch, with the drip-dry chandelier cleaner from Extend-a-Finish.